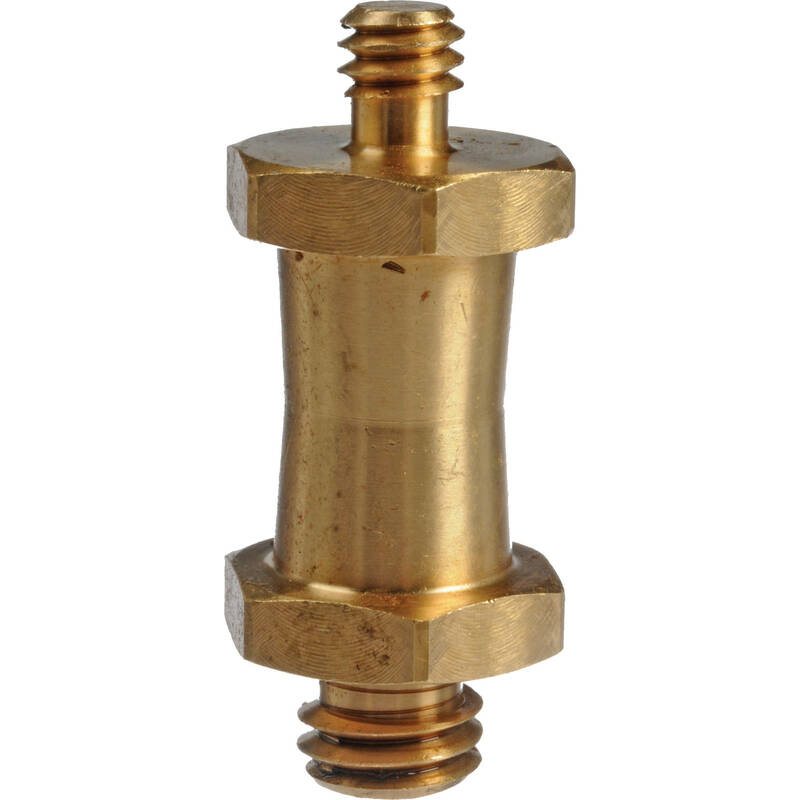 Box Dimensions (LxWxH) 1.0 x 0.5 x 0.1"
037 Reversible Short Stud, with 3/8" & 1/4"-20 Threads (Brass) is rated 4.3 out of 5 by 52. Rated 1 out of 5 by Joanna T. from Broke on first use I would give it zero stars if I could. The 1/4 part broke while screwing it into a manfrotto superclamp. Excellent luck that it didn't break with my camera mounted on. The thread part is logged in my superclamp thus rendering the clamp useless as well. I use it for timelapses, it it would have broken during a timelapse it would have dropped a camera & lens on 20 feet on the heads of 9 year old kids, 100% certainty of killing a kid. Read again: I would have been responsible for the death of an 9 years old kid! Beyond worthless, it is criminal. Rated 5 out of 5 by Manny from Better than the round one This is a must for preventing unwanted rotation of whatever is mounted on the stud. Fits all Manfrotto lighting gear. Rated 4 out of 5 by pcmofo from Not for Umbrella use! I ordered this for use in my umbrella stand as these are super useful and seem to disappear all the time. I searched on B&H for stud as that was what I thought it was called. Apparently I was looking for a Spigot which is identical but does not have the thicker hex shaped top and bottom so it will in-fact drop into an umbrella holder. B&H of course is great at accepting my return and I am even keeping one for use in my super clamp. This is one of those annoying parts you always need but never remember to order, looks like I should have looked harder at the details. Rated 1 out of 5 by Anonymous from Piece of garbage - Should be STEEL Broke mine before my first shot! The stupid thing should be made out of steel, not brass. The 1/4 inch threaded stud just snapped right off. You just don't put a 1/4 inch stud on a 3/4 inch barrel, made from brass, and expect it to not snap. Why did I buy this * ? Why does every Manfrotto product I own wind up breaking or losing pieces? Rated 5 out of 5 by Anonymous from Much more secure than a round ended Short Stud. Though a rounded end Short Stud will fit inside the Super Clamp it is the six sides of this one that make it more secure. The inside of the Super clamp where this fits have six sides thus a round stud though secure may turn. This Short Stud with its six sides at both ends when placed within the Super Clamp will not turn. Notice the center circumference is smaller than towards the ends, when using the tightening screw that design makes it even more secure. This Short Stud is excellent, for other uses I can also see the need for the longer one as well. Rated 1 out of 5 by jbrannon7 from Low quality Broke off just being hand tightened, very poor quality brass. Rated 5 out of 5 by Anonymous from Fits my needs perfect I needed this product with the hotshoe umbrella mount that I have, which I had added a swivel ball head to. Having this little item made this unit work together. What is the maximum weight that the stud can support? i.e. The super clamps say 33 lbs, and the tripod head say 6.6 lbs, but does that mean the stud can support a maximum of 7.6 lbs: 1lb (Weight of 056 3D Junior Pan/Tilt Head) + 6.6lbs (Load capacity of the 056 3D Junior Pan/Tilt Head) = 7.6lbs? I cant seem to find this information anywhere. Thanks! I don't have a specific weight for you, but I regularly use an 8 lb camera setup on the stud at a pretty sharp angle and I have not had any problems. Be careful to not over tighten as the soft brass metal will twist off fairly easily.